Roast chicken. It can't be that hard to do right? Well, yes and no. 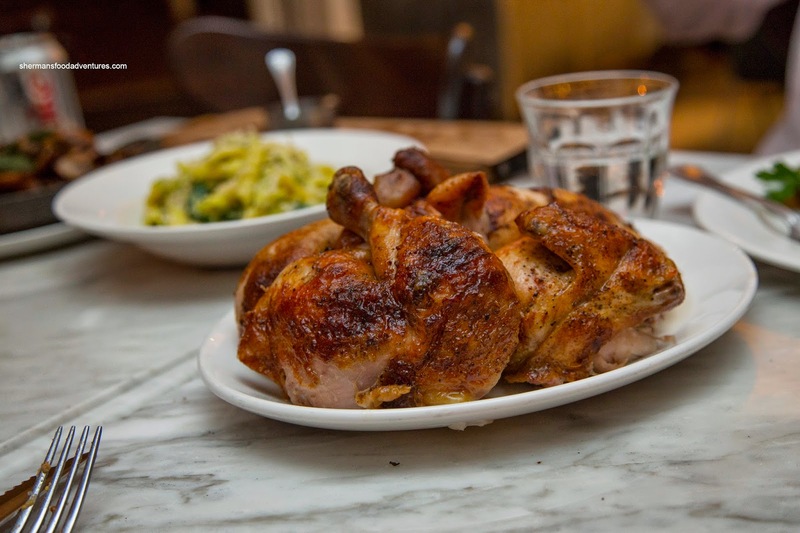 Roasting a chicken isn't necessarily difficult, but a juicy and tender chicken is not a given. Take typical supermarket versions for instance, you can get a juicier piece of shoe leather at times. There is one exception though, being Costco (with their brined, then rotisseried fowl). Actually, there has been suggestions that the aforementioned Costco chicken rivals a pricier version at the Homer Street Cafe. With Emilicious singing the praises of the place, I had to see for myself what this was all about. 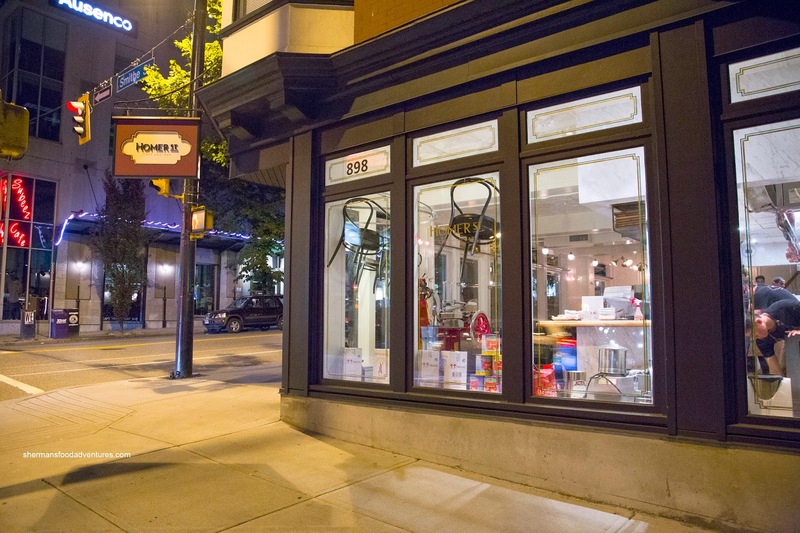 Conveniently open until Midnight, Homer Street Cafe was just the right fit after Friday night hockey. Milhouse, Bear, Emilicious and Gadget Girl were all willing to partake in the chicken feast. 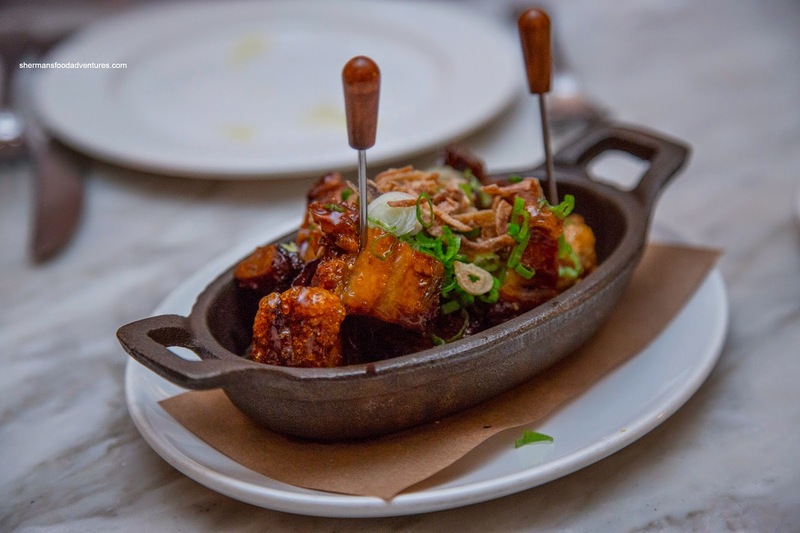 We initially had earmarked a salad as one of the starters, but Emilicious talked some sense into us and we ended up changing it to the Maple Butter Pork Belly. Good thing too as these little nuggets of joy were sinfully delicious. Firmly crispy on the outside while meaty and somewhat fatty on the inside, these were glazed with a sweet maple sauce. It was a nice compliment to the savouriness of the belly. 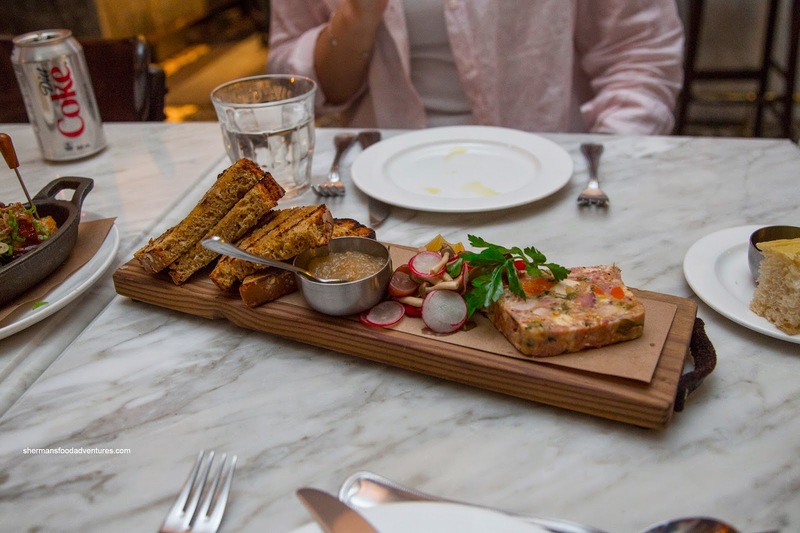 Next up was the Chicken and Smoked Pork Hock Terrine with pickled veggies and grilled soda bread. The rustic terrine featured nuggets of moist meat mixed with carrot, onions, gelatin and wine. Hence the flavours were meaty, sweet and tart. Although the bread was nice, we would've liked something more contrasting in texture. Onto the main event, we shared the Whole Rotisserie Chicken with pee wee potatoes, colelsaw and chicken jus (for $32.00). This was not a small chicken as the breast meat was substantial. With an aesthetically-pleasing golden-brown and nicely rendered skin, this was a tasty chicken. Not only was the dark meat juicy and moist, the breast meat was not dry at all. It was brined so the there was enough flavour on its own. However, the jus was pretty solid as well with a natural chicken essence. It was thickened so it wasn't watery and seasoned without being too salty. The side of potatoes had soaked up the drippings and were only salted enough to enhance the flavour. They were fork tender, yet were firm enough that they didn't break on contact. 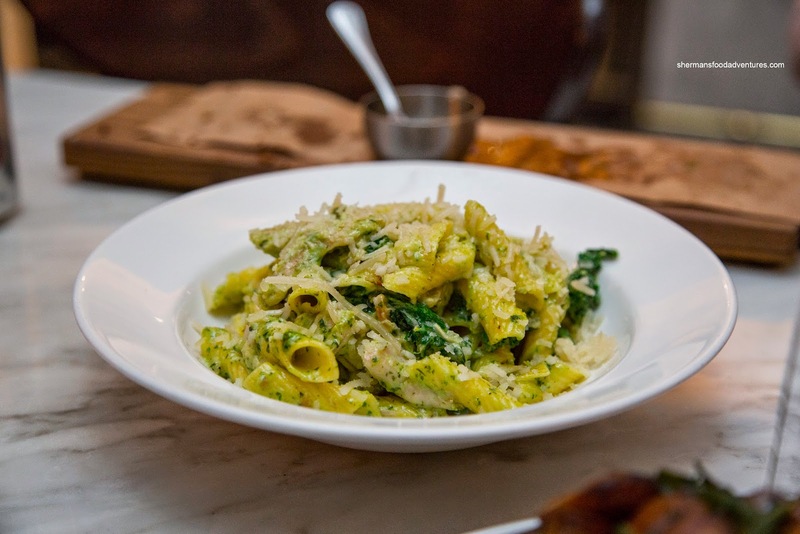 Of course a chicken would only go so far with us hungry folk, so we also tried their featured pasta being the Chicken Pesto Penne. I found the pasta to be mostly al dente while enveloped in a very creamy and rich sauce with only a modest hit of pesto. The flavours were mild while the addition of spinach provided some different textures. The big chunks of chicken were mostly white meat and were on the drier side. 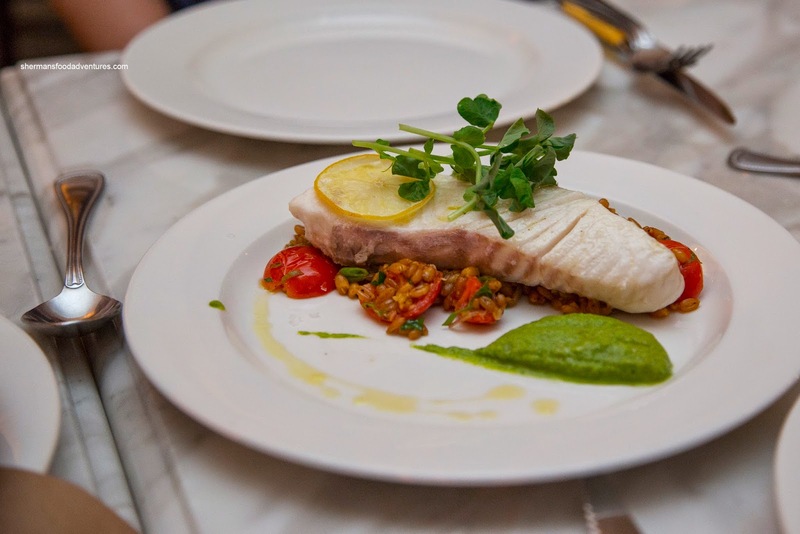 Next, we had the Lemon Baked Halibut with saffron, spelt berries, zucchini and basil puree. Although Gadget Girl thought the fish was a little overdone, I found it acceptably moist and flaky. It was lacking in seasoning though and the lemon didn't really come through. However, the berries underneath did add both a chewy texture and the necessary tart and sweetness. We felt the basil didn't add much to the dish. 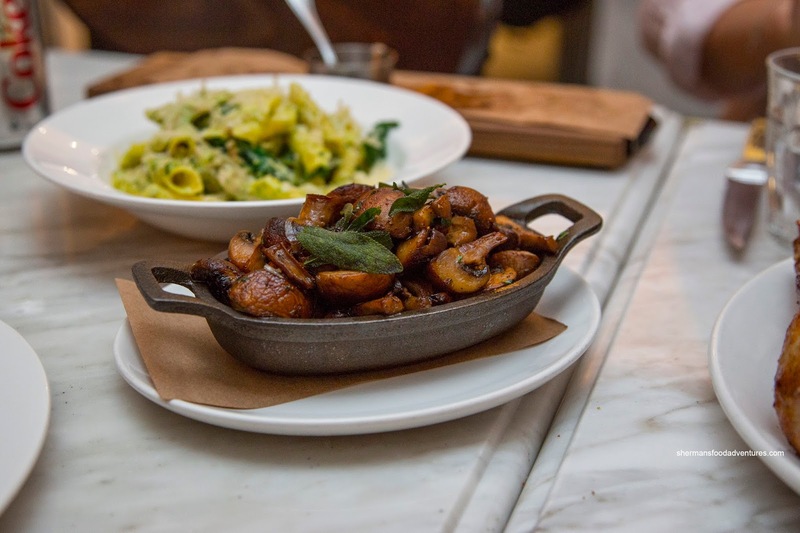 We also got 2 sides including the Sautéed Crimini Mushrooms with fried sage. This was another solid suggestion by Emilicious as the flavours exploded. In addition to the wonderful Earthiness of the mushrooms, there was a buttery garlic hit as well as the herbiness of the sage. 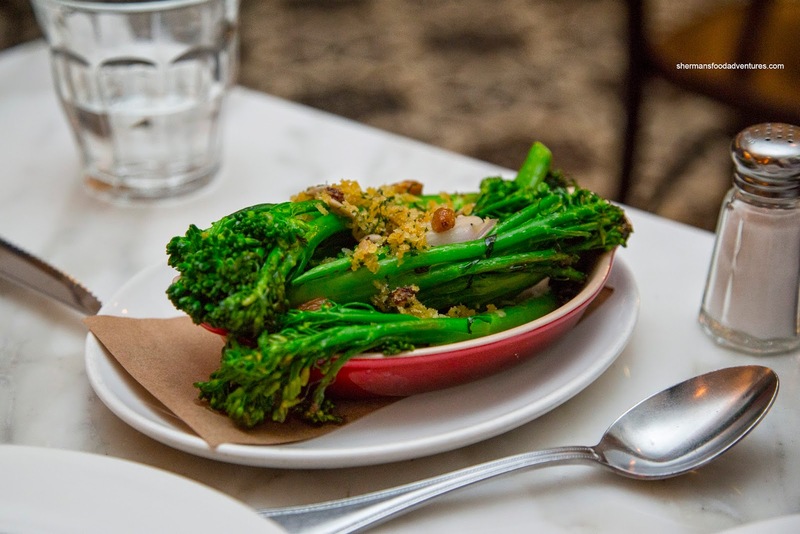 Lastly, we went for the Charred Broccolini with with golden raisin and sunflower seed gremolata. These were cooked just enough that they maintained their crunch and vibrancy. We didn't get much of the flavour from the other ingredients as they didn't adhere to the broccolini. 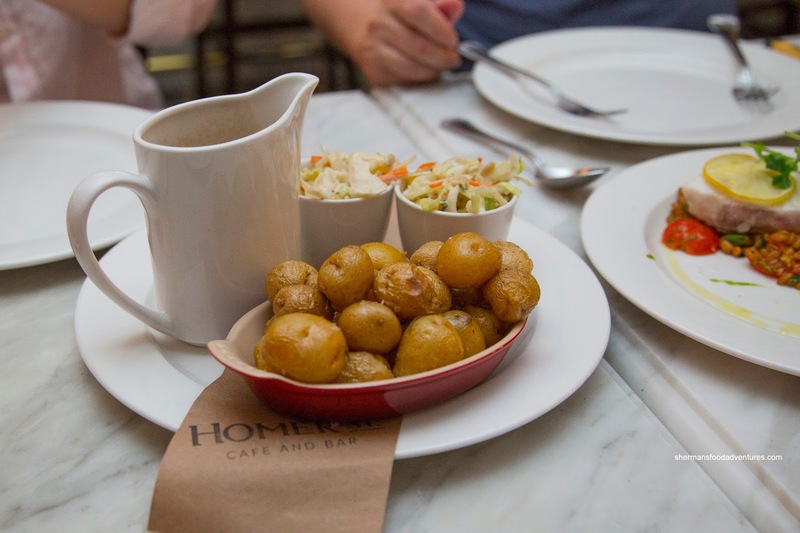 Alright, this is what I'm going to say about the chicken at Homer Street Cafe - it is really good. Is it better than a Costco chicken? Yes, but not twice-as-good. So why is it so much more expensive you ask? Well, unlike Costco, I get to eat this chicken right there at a nice restaurant in Downtown while being served. You can't really compare.